Cath Lab Physicians and Staff Can Decrease Their Radiation Exposure Risk by Doing this One Thing - MED Alliance Group, Inc. According to Cardiovascular Diagnosis and Therapy, over one million cardiac catheterization procedures are performed annually in the United States.3 Although cardiac catheterizations are generally considered safe, radiation exposure is a risk for the patient as well as the interventional cardiologists and cath lab personnel. Over the past decade, older cardiac interventionalists have shown high rates of radiation complications, such as cataracts and left-side brain cancers.1 Many of these cases are thought to be linked to the use of ionizing radiation. The RADPAD® is the only clinically-proven, non-lead and non-vinyl, lightweight and disposable shield that can guarantee a 95% reduction in x-ray scatter radiation. 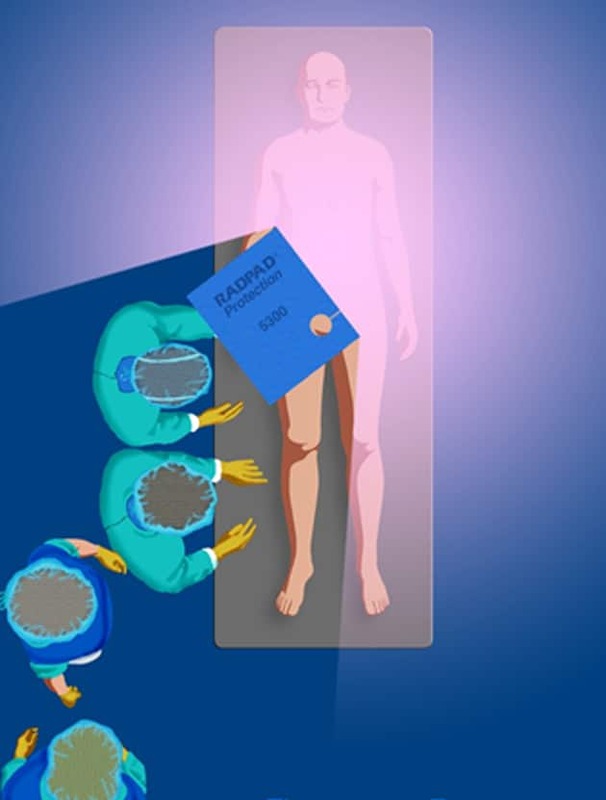 The RADPAD® shield works by creating a “shade zone” on the patient where radiation is absorbed into the shield. This allows the clinician to move freely within this zone with significantly reduced scatter radiation, all while protecting the patient. RADPAD® 5000 series products are comprised of several procedure-specific radiation protection shields designed to provide maximum protection to the operator and cath lab personnel during fluoro-guided procedures. RADPAD® 7000 series are comprised of several procedures specific sterile drape + RADPAD® Radiation Protection Shields, designed to protect operators and cath lab personnel during fluoro-guided procedures. RADPAD® No Brainer® is an attenuation material-lined scrub cap worn by the cath lab personnel to protect their brain from scatter radiation during fluoro-guided procedures. RADPAD® Thyroid Shield w/ Cover is a RADPAD® thyroid shield worn by the cath lab personnel to protect thyroid glands during fluoro-guided procedures. To learn more about the RADPAD® and how your cath lab personnel can stay protected, please email us or call 888-891-1200. Radiation Exposure May Increase Alzheimer’s Risk – How Can You Stay Protected?